As the world of music gathered at Madison Square Garden on Sunday for the 60th Annual Grammy Awards Logic gave one powerful performance that stole the show. Following the show’s “In Memoriam” segment, which ended with Linkin Park frontman, Chester Bennington, Rappers Logic, and Khalid took to the stage alongside Best New Artist Winner, Alessia Cara, to deliver one of the most moving and talked-about moments of the entire evening. 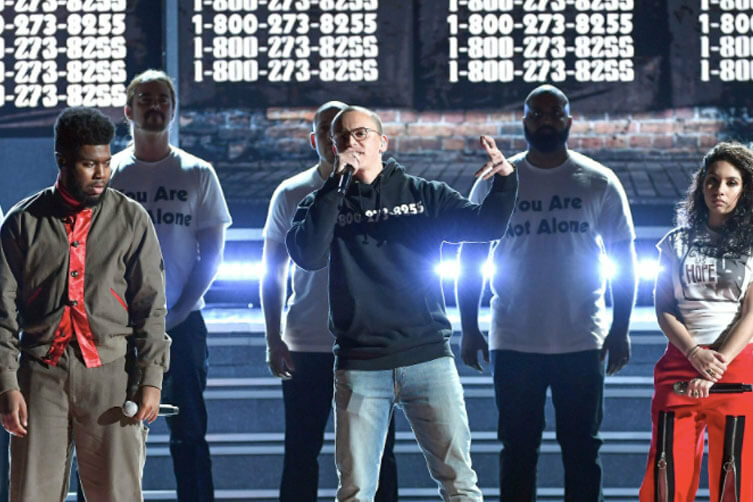 The trio performed Logic’s hit song “1-800-273-8255,” which is titled after the National Suicide Prevention Hotline. Joining them on stage were suicide attempt survivors and others who have lost loved ones to suicide. They wore shirts that read, “You are not Alone,” as the suicide hotline number flashed on the screens behind them. At the end of the performance, Logic addressed just about every social justice issue America is grappling with today and offered encouragement to every single person watching.